We welcome your visits here at Savannah’s Candy Kitchen. We have been making candy and memories from scratch for over forty years. We consider it an honor to share our family confections with you. Savannah’s Candy Kitchen has made southern confections known from coast to coast —from our famous Savannah’s Original Pralines, saltwater taffy, to hand stretched peanut brittle. Whether for holidays, office parties, gifts, or just because, we have you covered with an assortment of tasty candies, cakes, and pies. 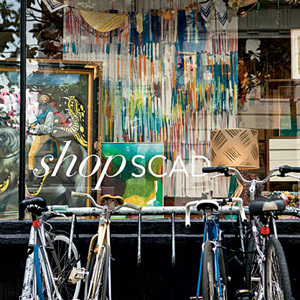 ShopSCAD features exclusively the artwork and designs of students, professors, staff and alumni of the Savannah College of Art and Design. It is located in Poetter Hall, the first building that SCAD acquired in 1979.